Before doing any research on this problem, all I knew was that the phone would constantly restart, rebooting over and over again, making the thing absolutely useless. I had no idea if it was a well-known issue or if many other folks had experienced the same problem. After some quick Google-sleuthing, I learned that this LG G4 defect is actually quite common and very well known as the “LG G4 bootloop“. In fact, just about every single one of the earlier manufactured LG G4 phones will be struck by this issue at some point. Whether it happens after 5 months of use or after 13 months of use, you just won’t know until it abruptly stops working. They’re just little ticking time bombs, ready to start their new life as never-ending reMcBooters, when you least expect it. Certainly not as scary as a Samsung Note that might literally explode in your pocket, but still quite a concerning manufacturing defect. In January of 2016, LG issued a statement on the defect, stating that it “has now been identified as resulting from a loose contact between components.” To fix the issue, LG warranty service technicians have been swapping out the system board in the G4 smartphones. It’s unclear, however, if this system board swap is just a temporary fix that will result in another bootloop problem down the road, or if it’s actually a permanent fix that will help keep an LG G4 phone booting up smoothly as intended for many years to come. Verizon support: Have you tried removing the battery completely, waiting 5 seconds, reinstalling the battery and then powering on the device? Me: Yes, that didn’t fix the issue. Verizon support: Have you tried booting it into safe mode? Verizon support: Have you tried removing the microSD card? Me: Yes, that didn’t fix the issue. I also tried a different battery and a different SIM card, neither of which fixed the issue. Verizon support: Have you tried factory resetting the device? Me: No, I don’t want to do that yet because I want to attempt to transfer some files and data off the device first. That’s where it got a little bit squirrelly, as Verizon support policy states that they cannot approve a warranty replacement if the customer doesn’t first attempt a factory reset on the phone, in a last ditch effort to resolve the problem. 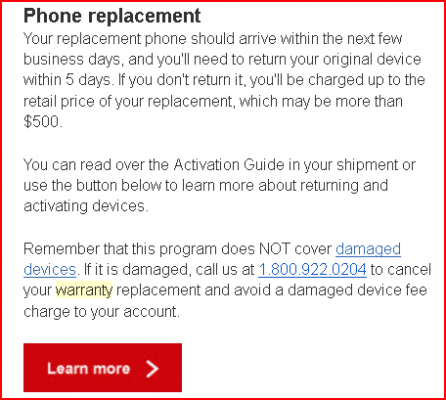 This Verizon mandate that forces customers into factory-resetting their device before approving warranty service is quite heavy-handed, and I don’t agree with the policy, but I can understand their rationale for enforcing it. I suppose if you’re sending your phone in for warranty replacement that you shouldn’t have a problem factory-resetting it, as you likely won’t get the original device back anyway. Admitting defeat, I performed a factory reset on the device, which provided absolutely no relief of the issue, as expected. I then got on the horn again with big red and this time they approved an in-warranty replacement of my LG G4. Other than the strong-armed factory reset, Verizon’s warranty service process is quite easy and convenient. Once approved for warranty service, they quickly ship you out a replacement device. Once it arrives, you have ‘5 days’ to send back the defective device, else you risk being charged for the replacement device. Below, you can see a portion of the “Is your device acting up? No problem” Verizon email that I received as part of their Certified Like-New Replacement Program. My replacement device arrived, I powered it up and everything worked just fine. It even felt like the substituted LG G4 was getting better battery performance, even though I was still using the same old battery. My replacement LG G4 has a serial number starting in 607, whereas the older defective device serial number started with 505 (image below). However, even though my replacement device has a serial number starting with larger numerals, it still says “H/W REV : 1.0” on the info sticker. Perhaps that’s not a problem since it has a new system board? Only LG knows. Unfortunately, reading through some of the discussion threads on the mobile phone forums, it seems that there are some LG G4 owners that have experienced the bootloop issue even on G4’s that have been replaced via warranty service. If you have an LG G4 phone affected by the bootloop issue, try to get warranty service through your service provider (Verizon/Sprint/T-Mobile/AT&T). If your service provider refuses, try to get warranty service directly from LG. LG has actually been providing warranty service to some out-of-warranty LG G4 devices due to how widespread and well-known this bootloop issue is. Kudos to LG for replacing some devices that are out of the official warranty period, but bad on them for not issuing a recall on these devices long ago when they should have. If you don’t own an LG G4 and are considering buying one used or second-hand, DO NOT DO IT. As mentioned above, the older batches are ticking time-bombs and can transform into hungry hungry rebooters at any time. As far as I’m concerned, the value of a second hand LG G4 is exactly $0.00. As for me personally, ~3 months after receiving my replacement LG G4, it seems to be working just fine. I can only hope that it is not still susceptible to another bootloop attack, as I am now flying precariously in the out-of-warranty skies. Disclosure: I formerly worked for Verizon Telecom. Hi! Very late reply to your post here, but I was just wondering if your Latest G4 (that you ended your post with by establishing 3 months hassle free!) has held up or how long it last? Did the bootloop return? Thank you! hey Mark! So far it has held up (~ 1 year later). No bootloop on the new device thus far and it’s still my primary device.